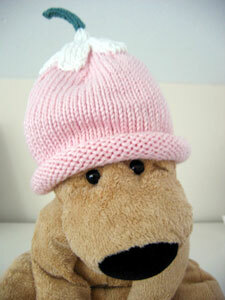 Another Itty-Bitty Hat ! The upside-down daisy hat was just so cute, I couldn't resist. I love how the detail is really on the top of the hat, so you can see it best when baby's in the stroller or baby carrier. Wee one's going to be so sweet in this one! The yarn was Berroco Touche I happened to have in my stash. I enjoyed working with the yarn, it knits up nicely and is a bargain!